If you haven't done it already, now is the time to pull out your slow-cooker, dust it off, and make it a permanent fixture on your counter. The kids are back in school, the holidays are coming up, and sometimes life is just plain hectic. Thank goodness for slow-cookers and recipes like this. It is super easy to throw together, tastes fabulous, and only dirties one dish. Plus it is healthy! 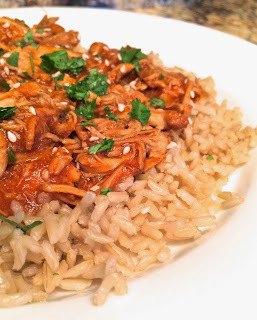 Place the chicken in the bottom of the slow-cooker. Sprinkle pepper over the top. In a small bowl, whisk the soy sauce, tomato paste, honey, vinegar, sriracha, 1 tbsp water, sesame oil, onion powder, ginger, and garlic powder together. Pour over the chicken. Cover and cook on low 3-4 hours, or until the chicken is cooked through and easily shreds with a fork. Remove the chicken and turn the slow cooker to high. Whisk the cornstarch and 1/4 cup cold water together in a small bowl, then stir into the sauce in the slow-cooker. Cover and cook 20-25 minutes, or until slightly thickened. Meanwhile, shred the chicken into bite-size pieces with two forks. 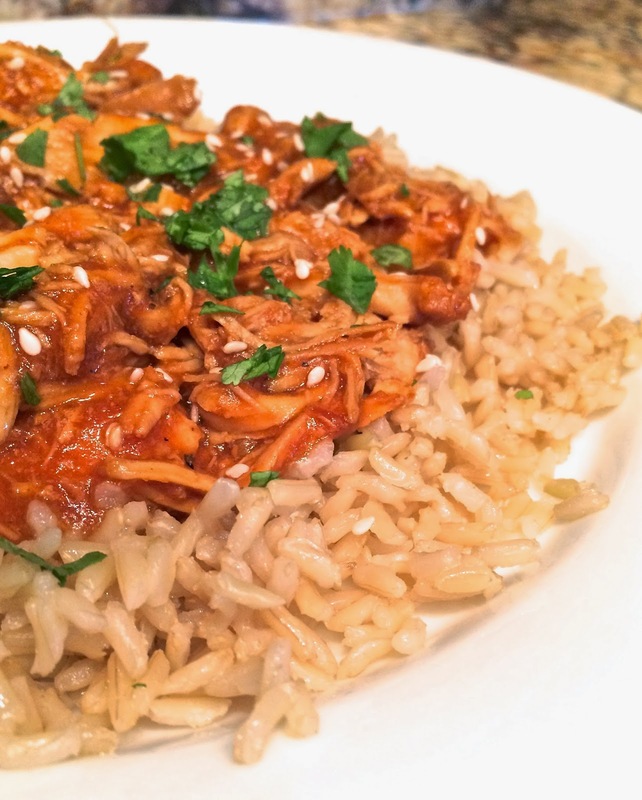 When the sauce is ready, return the shredded chicken to the slow-cooker and toss to coat. Season with salt and pepper to taste. Serve over rice. Garnish with sesame seeds and green onions as desired. *I used cilantro since that is what I had on hand.